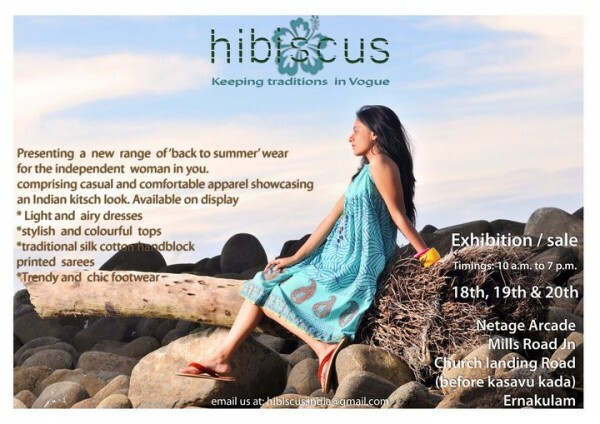 Hibiscus , a designer brand is organizing an a three day exhibition and sale of its products starting from August 18th at Netage Arcade, Mills Road Jn, Church Landing Road. HIBISCUS will present a delightful collection of delicate, hand block printed, free flowing silhouettes. Each garment is crafted in unique designs and attractive hues. The exhibition on 18th, 19th and 20th of Aug presents a new range of ‘ back to summer’ wear for the Today’s independent woman. It comprises of casual and comfortable apparel showcasing an ‘Indian kitsch’ look. Available on display are dresses ,stylish and colorful tops,traditional silk cotton hand block printed sarees in addition to trendy and chic footwear. HIBISCUS is a brain child of Elsa Mary Thomas , a NIFT Chennai graduate, who has set a unique example by combining design with vision and passion to spread Indian culture across the globe.It was Elsa’s eye for detail and her aptitude to combine the traditional with the modern, facilitated her to create her ready to wear brand HIBISCUS in 2008.